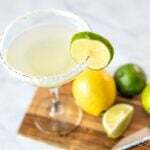 This Homemade Margarita Mix is a simple recipe to make from scratch and only needs four simple ingredients – limes, lemons, sugar and water. It’s easy to make and really delicious! This past weekend was my husband’s birthday. He’s an easy-going guy and only asked for two things for his special day – a birthday cake (his favorite, a Victoria Sandwich Cake, the same one I make every year) and homemade shrimp tacos for dinner. Super easy. I figured while I was at it, I’d make his favorite drink – homemade margaritas. Instead of buying mix from the store (which has some pretty gross ingredients in it) I made a batch of my own margarita mix. It’s so easy to make – you’ll never buy the pre-made one again! The margarita mix only requires four basic ingredients: limes, lemons, sugar and water. The first thing I did was to make a simple syrup. That’s basically just a fancy term for sugar dissolved in water. Once that had been allowed to cool, I juiced half a cup of limes (about 4 limes) and half a cup of lemons (about 2 lemons). Looking For More Easy Recipe Ideas? Combine the simple syrup and the juice in a bottle or mason jar and you’ve got yourself a very nice homemade margarita mix! When you’re ready to serve your Margarita, simply add tequila (and triple sec if you’re really going for it!). Don’t forget to salt the rim! That’s my husband’s favorite part! Just add equal parts salt and sugar to a plate. Rub a lime around the rim of a margarita glass and dip in the salt mix. Cut a slice of lime, place on the side of the glass and pour in your chilled margarita mix and tequila. I think our margaritas really were the cherry on the top of a wonderful birthday dinner for Brian! If you’re a margarita fan, you’re going to have to try this recipe. I know you’ll love it! Making your Margarita Mix from scratch requires four simple ingredients - limes, lemons, sugar and water. It's so easy to make at home and absolutely delicious! In a saucepan, combine the sugar and water. Over medium heat, allow to dissolve. Set aside to cool. Juice the limes and lemons, making sure no flesh or seeds get through. Add the juice to the simple syrup. Store in a glass bottle in the fridge for up to two weeks. Add tequila (and optional triple sec). Salt the rim of the glass before serving. Serve chilled. You can easily double or triple the recipe if you're making this margarita mix for a lot of people.